There seems to be indisputable proof that Sauk county has been twice occupied by aborigines, the mound builders and the Indians that were in Wisconsin when white man first came to the northwest. Who or what was here before the mound builders, we have no material or traditional evidence on which to found so much as a theory or conjecture. Humans may have been here long before the period in which that old glacier got stuck on the Baraboo Bluffs, but we are unable to discover any of their handiwork; and if any of their skulls are deposited here-about, we have not yet unearthed them. It is the belief of the writer of this paper that the mound builders were a different people from the Indians found here by the whites, not entirely because their earth works were distinctive, but because all of the recent tribes of Wisconsin territory are known to have been immigrants. The Algonquins, Sacs, Foxes, Pottawatomes, Menominees and Chippawas, all came in from Canada at comparatively recent dates; the Souan Winnebagoes are not indigenous, as is proven by their traditions and language. But at what time the mound builders were here, from whence they came and to what clime they immigrated after they had lived their life and built their monuments, are questions not to be discussed in this paper. That these mound builders were a numerous people, their works attest. That they lived a higher civilization than any of their successors on this soil, there can be no doubt. They were as much superior to their followers, as were those peoples who built in Egypt, or Peru, or Yucatan, superior to the barbarians that followed them in their respective countries. So, whether the mound builders were a distinct race, or just common Indians, is not material; their successors, or descendants, were of a different civilization, a wholly different people. If a distinct race, they were certainly of an inferior race; if they were the descendants of the mound builders, they had become hopelessly decadent. But the province of this paper lies in the record left by the Indians that have occupied Sauk county since white man has made written history in this section. Sauk county lay well within the uncertain and mysterious boundary of the vast tract owned by the strong and numerous tribes of the Winnebagoes. The Winnebagoes were a peaceful people and seemed not to have resented the encroachments of the Sacs and Foxes. They could afford to be generous, for they had little use for their great possessions, except in the hunting season. They dwelt mostly on the shores of Lake Winnebago, in the extreme northeast of their domain. It does not appear that they made any serious objection to the occupancy of the Sacs, who set up a strong village on the western bank of the Wisconsin river, at the point now covered by the villages of Prairie du Sac and Sauk City. Captain Jonathan Carver, one of the earliest explorers to leave a written record, says they came to this point as early as 1736, but it is recorded in authentic history that they moved there in the year 1746. It may be that the Sacs began the building of their village as early as 1736, because it is recorded that they were in trouble with the French, who had headquarters at Green Bay. It is a curious fact that the Sacs and Foxes were the only Indians in this territory that could not get on peaceably with the French. Before 1736 they had been twice at war, and twice the commandant at Green Bay had reported the turbulent and treacherous Sacs and Foxes as utterly annihilated. Yet they recuperated their forces and courage to such a degree that Charles de Langlade, the French commandant, administered another chastisement and again reported to his superiors at Quebec that the Sacs and Foxes would trouble no more, they were completely exterminated. It was the remnant, the survival of this third annihilation, that landed in this county and became the first permanent inhabitants of which we have a written record. Only the Sacs lived in this county, for their allies, the Foxes, lived across the river and a bit lower down, near the old village of Helena, in Iowa county. Here the Sacs seem to have set about recruiting their depleted ranks after a system of their own, by adopting men and women from the tribes with which they came in contact. They induced the most adventurous spirits from the Winnebagoes, Kickapoos and Menominees to join them. And in this proselyting they had a plenty of arguments. The other tribes were peaceful, and if the adventurers would have excitement they must join the Sacs and Foxes, for these restless fellows were never without some sort of an enterprise that promised hazard. Then the Sacs and Foxes were the most thrifty of all the western Indians. It is said they were never without a year’s supply of grain. They were good farmers, successful hunters—splendid providers. The argument of meat and bread seems to have been potential with the Indians, as it still is with their civilized white brethren. So we find that in the short grace of 20 years the Sacs had advanced from the state of annihilation to that of a tribe with 300 warriors. Captain Carver visited the Sac village in the year 1766, and writes it down as the best Indian village he had ever seen. It contained 90 large, well built houses, made of hewn planks, neatly joined at the corners, covered with bark so as to keep out the rain and the snow. He called it a town, and spent a day there. He said the streets were laid out regularly, were spacious, cleanly kept, and that the whole village had more appearance of a white man’s town than the dwelling place of Indians. The houses were large enough to accommodate several families, and each was provided with a shed (porch) where the people sat during the summer. When Captain Carver was there the fighting force of the Sacs was 300 warriors. They had great stores of corn, for they were an industrious people and the fertile prairies nearby yielded well to their industry. Many of their corn fields are yet traceable near both Sauk City and Prairie du Sac. So far as we are able to learn, the Sacs dwelt in peace with the whites during their occupation of the village on the Wisconsin river. It may be that the whites were out of their reach. Here Black Hawk was born, 1767, the year after Captain Carver visited the village; here he grew to young manhood; from here he went to his first war; with his father, then a lad of 15, and won his first credit by wounding his enemy. For this success in arms he was permitted to paint his cheeks and wear one eagle’s feather. Here The Prophet was born, the most treacherous of chiefs, like Black Hawk, of half Sac blood. This people, the Sacs, has left indubitable marks on the political institutions of the county. They gave to the county its name, for they were Sacs, Sauks or Saukies in the early books. The villages of Prairie du Sac, Sauk City and Black Hawk, the township of Prairie du Sac and Sauk Prairie, all are monuments to the Sac occupation. One would think that a location so advantageous for a people of their thrift in agriculture and the chase, as was the Sac village on the Wisconsin river, improved as it was with permanent construction, would not lightly be cast aside, except for the encroachment of the whites. Yet we find that in 1783, just 37 years after they took up their habitation there, they pulled up bodily and moved south to the confluence of the Rock and Mississippi rivers. Here they built another model Indian town and set about an insinuating system of benevolent assimilation for the benefit of their nearest neighbors, the Kaskaskia family of the once strong Illinois tribe. As the Kaskaskias did not appreciate the blandishments of the Sacs and Foxes, they cut out the course since followed by a certain white, Christian nations, that recently went into the benevolent assimilation business, and killed such as failed to welcome their righteous advances, annexed their territory and such of their property as they had use for. This benevolent assimilation might be called another political legacy of the Sacs and Foxes. Thus began and ended the occupation of the Sacs in Sauk county. It was the most important of which we have authentic history. After leaving for the south, the Sacs never returned, except for a wretched survivorship of old men, squaws and children, that stampeded across the county after the butchery of Wisconsin Heights, in the summer of 1832. This was the tragic ending of six weeks of hysterics among the white settlers, known to history as the Black Hawk War. The battle of Wisconsin Heights, the only move in the campaign that brought any credit to American arms, was fought on the bluffs across the river from Sauk City. 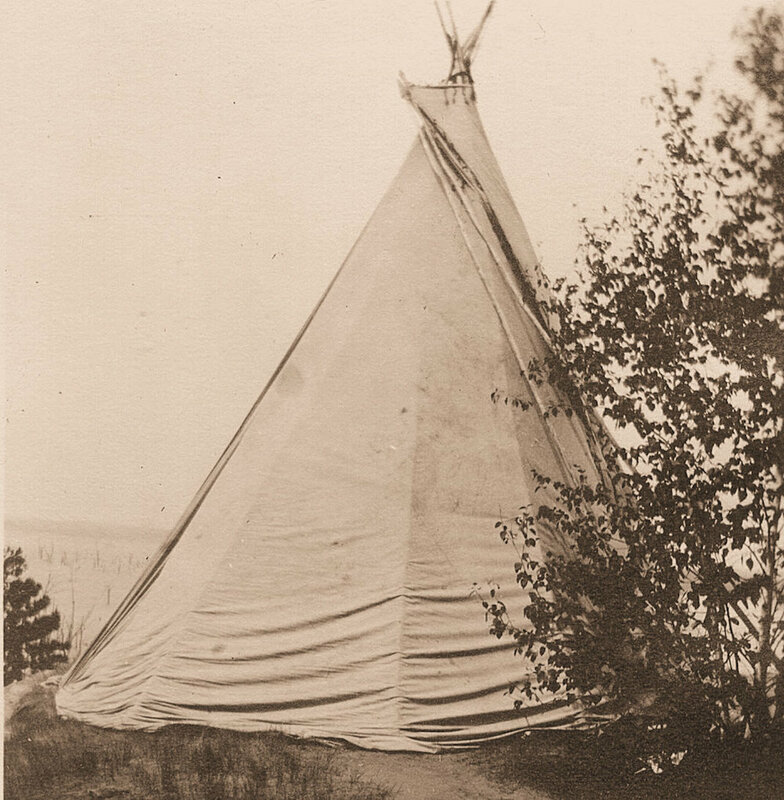 Here the heterogeneous collection that formed Black Hawk’s army, was miserably shattered and scattered by the well organized frontiersmen, and the survivors, mostly women and children, crossed the river by night to escape for a few days the fury of the whites, then thirsty for blood and hungry for Indian land. Published in the Baraboo Daily News and the Baraboo Weekly News.